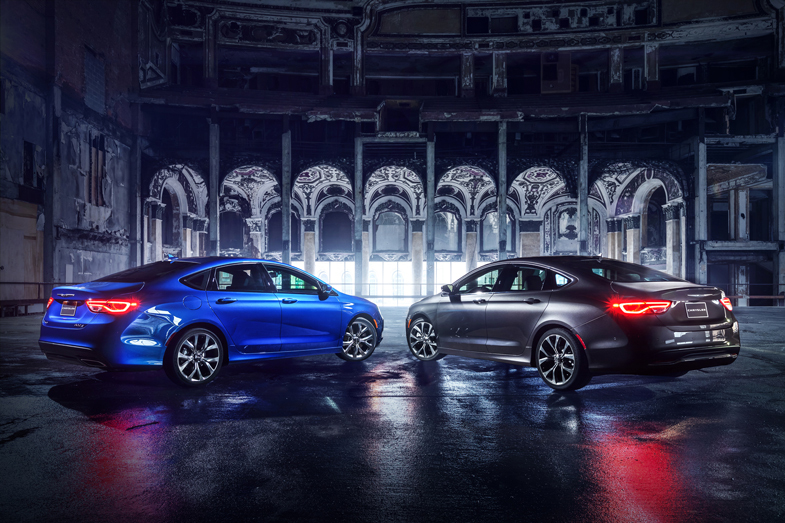 The 2015 Chrysler 200 debuts a beautiful exterior design featuring the new “face” of the Chrysler brand – a thoughtful, exquisitely crafted interior and an exceptional driving experience, complements of a segment-first nine-speed automatic transmission and an Alfa Romeo-based chassis. With the choice of two world-class engines, an innovative all-wheel-drive system, available sport mode and paddle shifters for an engaged driving experience, and estimated highway fuel economy of 35 miles per gallon (mpg), the all-new Chrysler 200 makes the commute something drivers will look forward to. 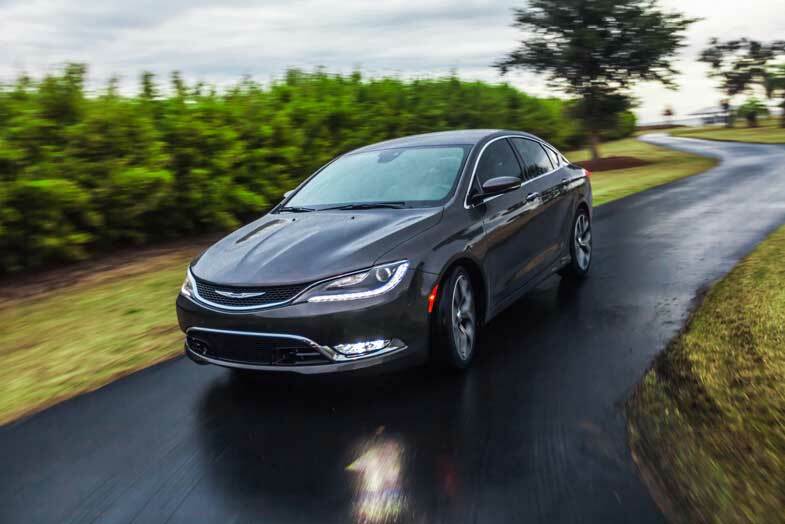 The all-new 2015 Chrysler 200 offers the most available safety features in the mid-size sedan segment, and state-of-the-art, easy-to-use technology that keeps drivers and passengers connected. With a starting U.S. Manufacturer’s Suggested Retail Price (MSRP) of just $21,700 (excluding $995 destination) the all-new 2015 Chrysler 200 is a sedan that customers will be proud to own, at a value they will appreciate. 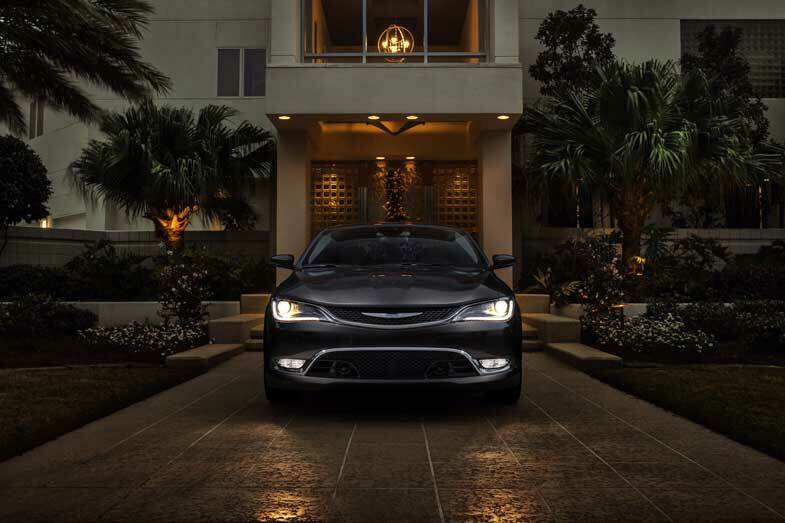 The 2015 Chrysler 200 is designed, engineered and built with pride in Michigan. With a major investment of more than $1 billion, Chrysler Group’s Sterling Heights (Mich.) Assembly Plant (SHAP), once slated for closure, sports an all-new paint shop using leading-edge technology, a new, fully robotic body shop and an upgraded assembly area, setting the stage for the world-class craftsmanship found in the all-new 200. Inspired American design and beautifully crafted inside and out, the all-new 2015 Chrysler 200 transforms what customers expect in a mid-size sedan. 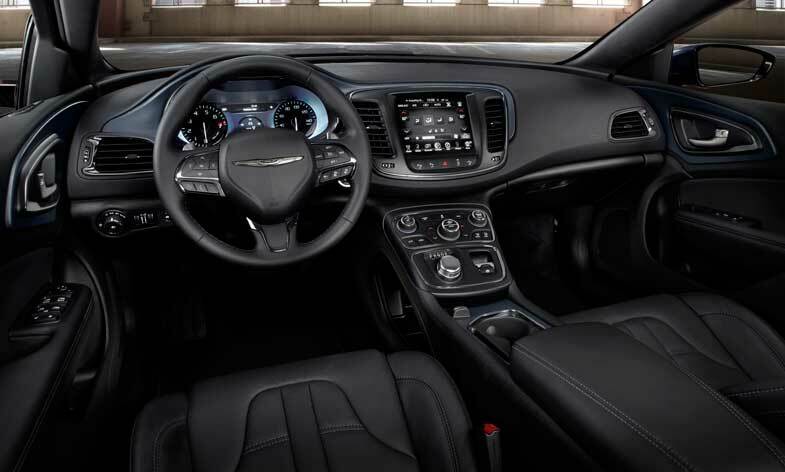 The 2015 200 sedan showcases the new face of Chrysler, and incorporates timeless design cues that let the car tell the story. 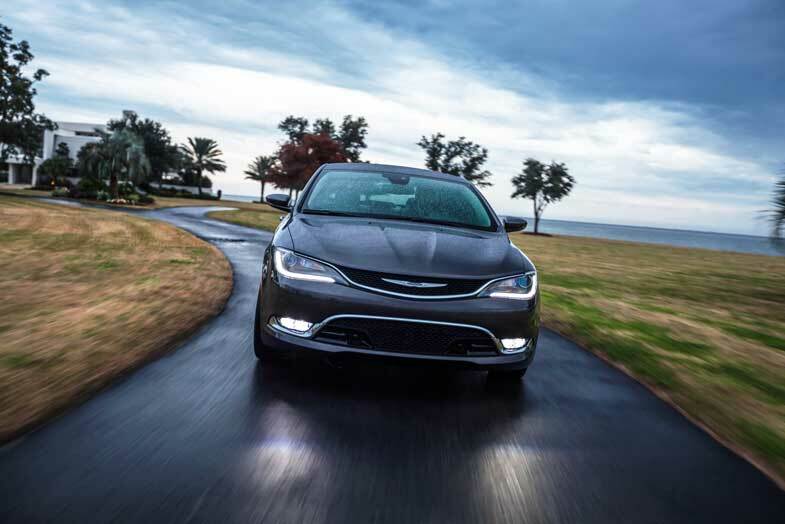 Clean, expressive surfaces define the all-new 2015 Chrysler 200; it’s a timeless American design based on simple elegance. The 200 sedan, with its muscular yet soulful presence, embodies a strong, sculptured exterior that drivers will want to touch and feel. The restrained design is not ornamental or full of line work instead it showcases sensual lines and fluid surfaces, which highlight the coupe-like appearance. The all-new 2015 Chrysler 200 debuts the new “face of Chrysler.” The grille and headlamps are integrated for the first time and the updated Chrysler badge has an emphasis on the wing, which is more defined. 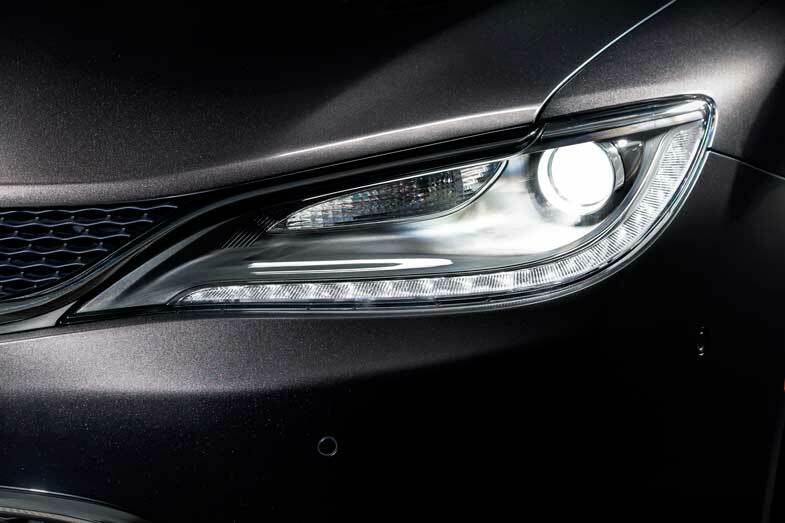 The signature light pipe or available full-LED daytime running lamps (DRL), LED fog lamps and standard LED taillamps give the all-new Chrysler 200 a distinctive, recognizable look coming and going. The Chrysler 200S model delivers an exclusive style – darker, more sinister – not found on other models in the lineup, or in the mid-size sedan segment. The 2015 Chrysler 200S model features gloss black trim and accent pieces rather than the standard bright trim. The exclusive design of the daylight opening (DLO) trim, the area surrounding the side windows, is gloss black – the 2015 Chrysler 200 is the only vehicle in the segment with this feature. Integrated dual exhausts are standard and the available 19-inch Hyper Black aluminum wheels complete the look. The more sinister appearance of the 2015 200S model complements the sportier driving experience the S model delivers. 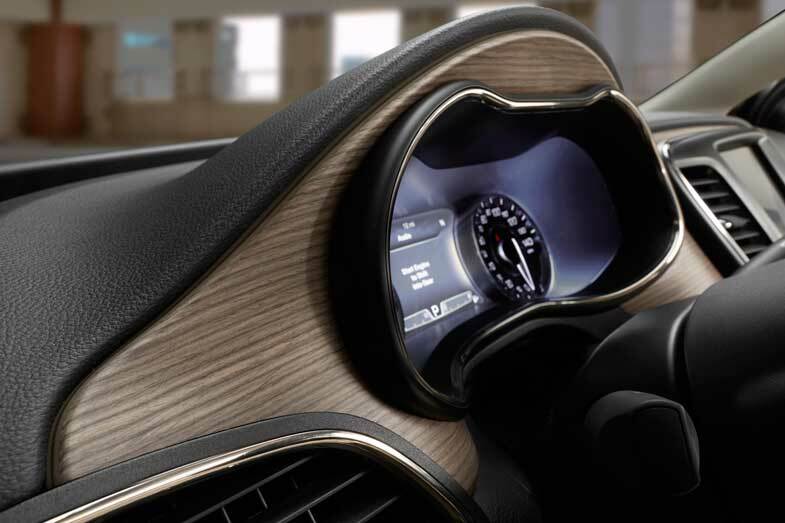 Using four key principles – an emotional design impact, use of high-quality materials with honest material execution, state-of-the-art technology and clever storage features – and inspired by classic, thoughtful American design, the interior of the all-new 200 sedan is unequaled in the segment. The striking interior color and trim combinations were inspired by celebrated American locations, such as 5th Avenue in New York City, Sausalito, California and Detroit. The all-new Chrysler 200 is loaded with state-of-the-art, high-tech features and amenities that will surprise and delight customers. 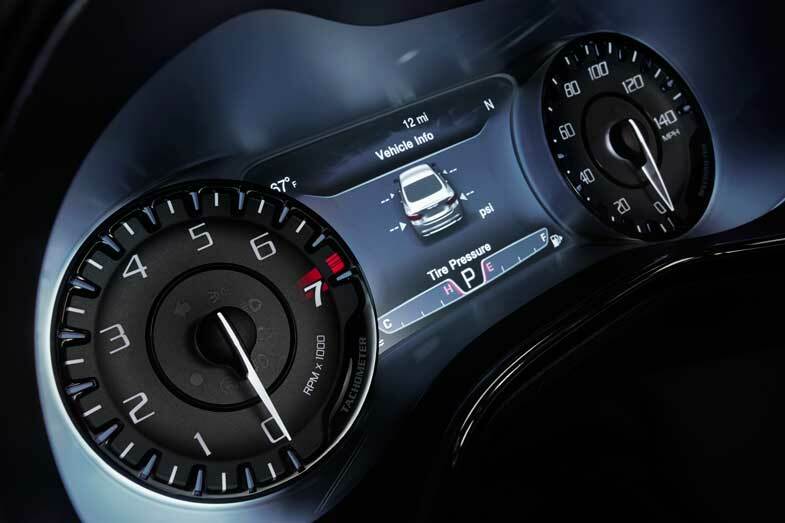 The available 7-inch LED full-color instrument cluster allows drivers to receive information and feedback in the format they prefer, similar to an iPhone. A glowing bezel surrounding the instrument cluster gives off a distinctive, pleasing blue glow. The available screens show information such as real-time fuel economy, turn-by-turn navigation, compass, outside temperature, speed, time and other useful information. The display is easy to use and easy-to-read, which allows drivers to keep their hands on the wheel and eyes on the road. 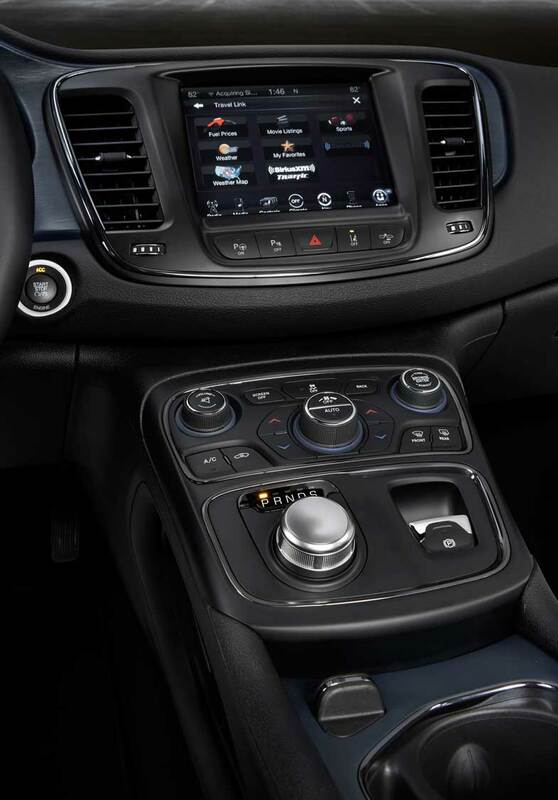 The 2015 Chrysler 200 features the available award-winning Uconnect 8.4-inch touchscreen multimedia command center. It is attractive, intuitive and easy to use. Uconnect Access keeps drivers and passengers connected with helpful information such as fuel prices and movie listings. Voice-activated navigation, handsfree voice commands and voice-to-text are some of the available features that allow drivers to keep their eyes on the road and hands on the wheel. Exquisite style meets exceptional performance. 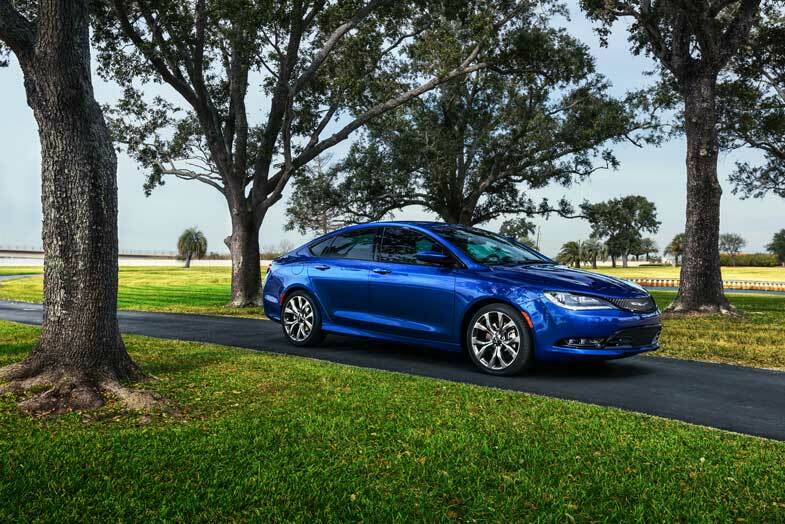 The all-new 2015 Chrysler 200 sedan leapfrogs expectations in the mid-size sedan segment for comfort, ride and handling. Engineered to provide premium driving dynamics, improved fuel economy estimated at 35 mpg highway, a quiet cabin and an enthusiastic driving experience, the all-new Chrysler 200 delivers exceptional ride and handling characteristics for all roads and weather conditions. A segment-first standard nine-speed automatic transmission and world-class engines, including the 3.6-liter Pentastar V-6 engine with a best-in-class 295 horsepower, add up to an enjoyable, spirited driving experience in the all-new 2015 Chrysler 200. An available, innovative, state-of-the-art all-wheel-drive system includes a “sport” driving mode and delivers excellent performance in all driving conditions. With a world-class architecture and leading-edge technology, the new Chrysler 200 is engineered to exceed customer expectations in every category. The all-new 2015 Chrysler 200 is the world’s first mid-size sedan to feature a nine-speed automatic transmission, which comes standard. The benefits of the advanced-technology transmission are numerous, including an estimated highway fuel economy of 35 mpg when powered by the 2.4-liter MultiAir®2 Tigershark I-4 engine. The addition of more gear ratios reduces the frequency of speed changes associated with upshifting and downshifting – fluctuations that thwart fuel savings and undermine the driving experience. The high-tech transmission dispenses power smoothly for elevated refinement. Such performance is made possible because the ratio steps between its gears are smaller than those of other transmissions. 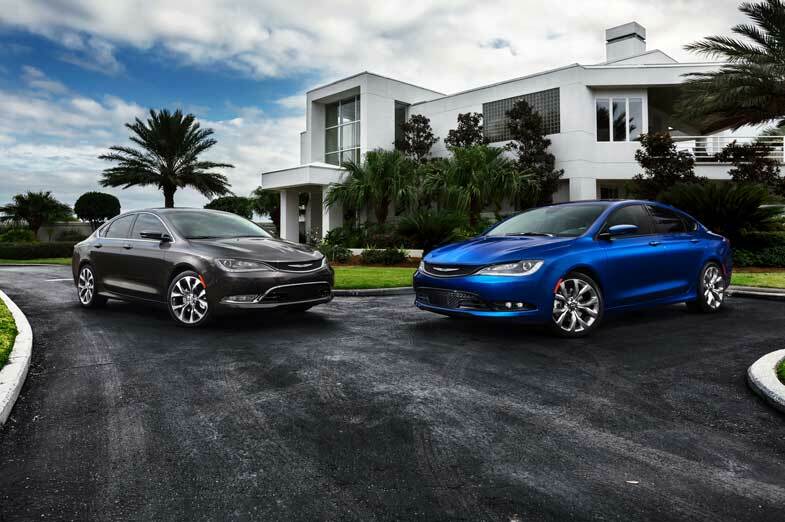 Two world-class engine choices power the all-new 2015 Chrysler 200 sedan. 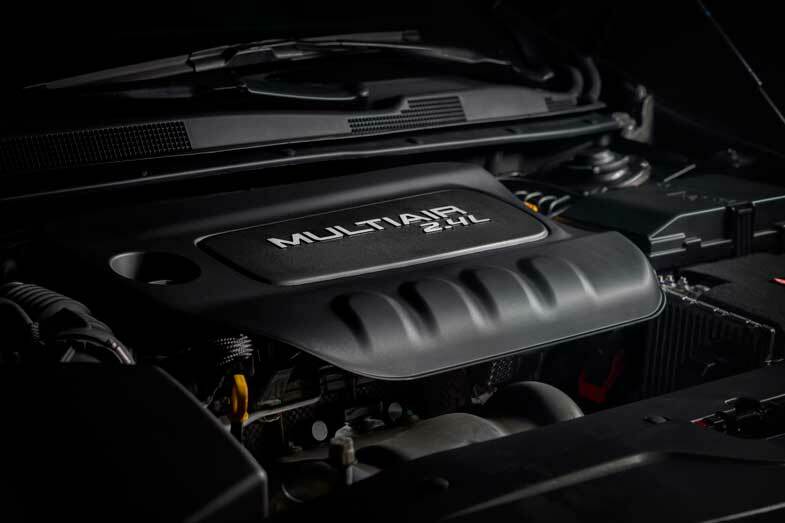 The proven, award-winning 3.6-liter Pentastar V-6 generates a best-in-class 295 horsepower as well as 262 lb.-ft. of torque. The new Tigershark 2.4-liter MultiAir2 four-cylinder engine produces 184 horsepower, 173 lb.-ft. of torque and delivers excellent estimated fuel economy of 35 mpg highway. The new standard Tigershark engine, that powers the all-new 2015 Chrysler 200, delivers fuel economy improvements of 13 percent, horsepower improvements of 6 percent and torque improvements of 10 percent compared with the outgoing four-cylinder engine. A new available sport mode in the 2015 200 provides a spirited driving experience by modulating steering, throttle and shifting inputs, electronic stability control, Adaptive Cruise Control Plus and all-wheel drive for a driving experience customers will look forward to. The all-new 2015 Chrysler 200 is the first Chrysler Group mid-size vehicle to offer paddle shifters, enhancing the driving experience for the driver who wants to experience all the car has to offer. The 2015 Chrysler 200 offers an available best-in-class all-wheel-drive system, which features a segment-first fully disconnecting rear axle that improves fuel economy by operating in front-wheel drive when all-wheel drive is not needed. The all-wheel-drive system features a one-speed power transfer unit (PTU) and uniquely disconnects and reconnects the rear axle – automatically and seamlessly – as needed and at any speed. The disconnecting rear axle disconnects at both the PTU and rear drive module, which improves fuel economy by reducing parasitic loss when all-wheel drive is not needed. Owners of the new Chrysler 200 will appreciate an innovative rotary e-shift dial that replaces the traditional console shifter. The rotary e-shift enables intuitive operation with a direct and confident feel. The convenient, center-mounted, easy-to- operate system provides total control of the sophisticated nine-speed transmission. This new design allows easy shifting and also yields space for more functional and usable storage in the center console. 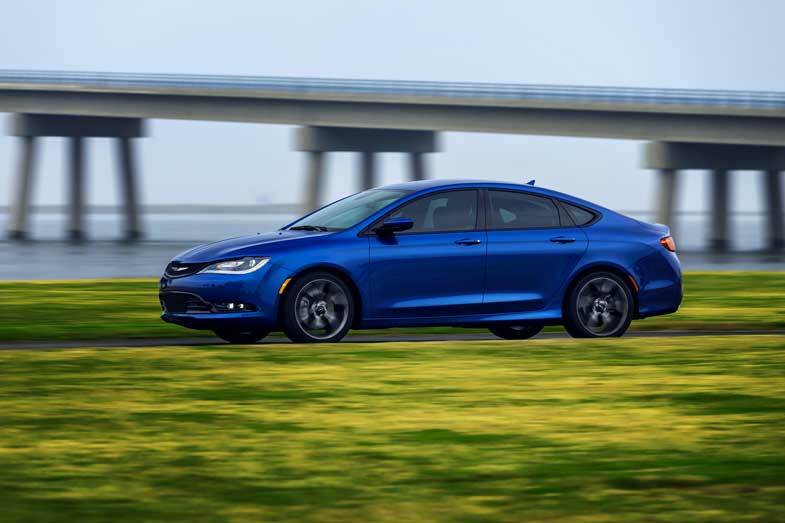 The all-new 2015 Chrysler 200 is the first mid-size sedan to utilize Chrysler Group’s Compact U.S.-wide (CUS-wide) platform, the basis for smooth on-road performance. The new body structure, including laser-brazed roof welds, delivers increased torsional stiffness, resulting in a more connected driving experience. The exceptional balance of fun-to-drive dynamics, ride comfort and emergency handling is accomplished through the suspension bushing tuning and the exceptional body structure, including the front aluminum cradle, rear upper/under body structure reinforcement and superior suspension attachment stiffness. The all-new 2015 Chrysler 200 is the most aerodynamic vehicle in its class, aiding improved fuel economy, on-road dynamics, and reduced noise, vibration and harshness (NVH). The quiet cabin is another positive factor in the superior driving experience. The all-new 2015 Chrysler 200 is a showcase of advanced safety and security technology, offering a comprehensive array of driver-warning and assist systems and state-of-the-art occupant restraints. The 2015 200 offers the most available safety and security features in the segment with more than 60. 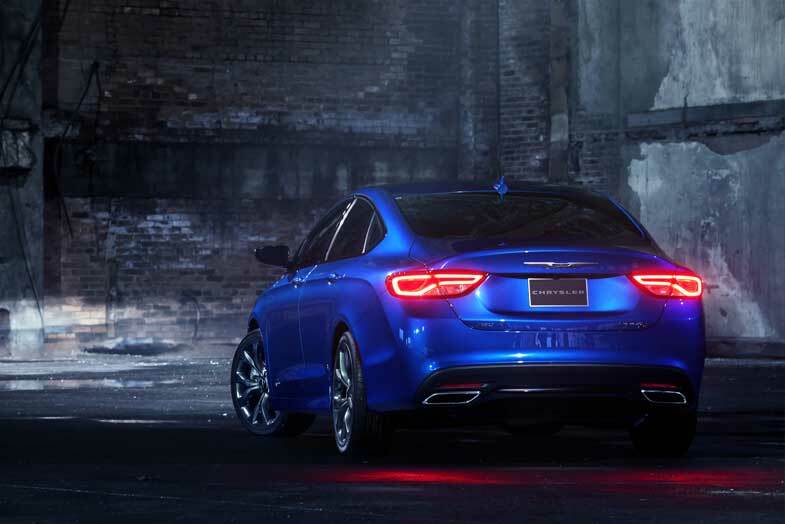 The all-new 2015 Chrysler 200 also offers ParkSense Parallel/Perpendicular Park Assist, which uses ultrasonic sensors to guide the driver into parking spaces. The perpendicular park assist function is a segment first. Also unique to the 2015 Chrysler 200 is the segment-exclusive standard electronic park brake with Safe Hold, which secures the vehicle if the driver opens the door and unlatches the seat belt while forward or reverse gears are still engaged. Other standard and available features include electronic stability control, electronic roll mitigation, four-wheel anti-lock disc brakes, ParkSense rear backup sensors, ParkView rear backup camera, blind-spot monitoring, Rear Crosspath Detection and LATCH child seat anchors. In addition, the all-new 200 is constructed with approximately 60 percent advanced-technology steel, which contributes to a strong safety cage and robust crashworthiness. 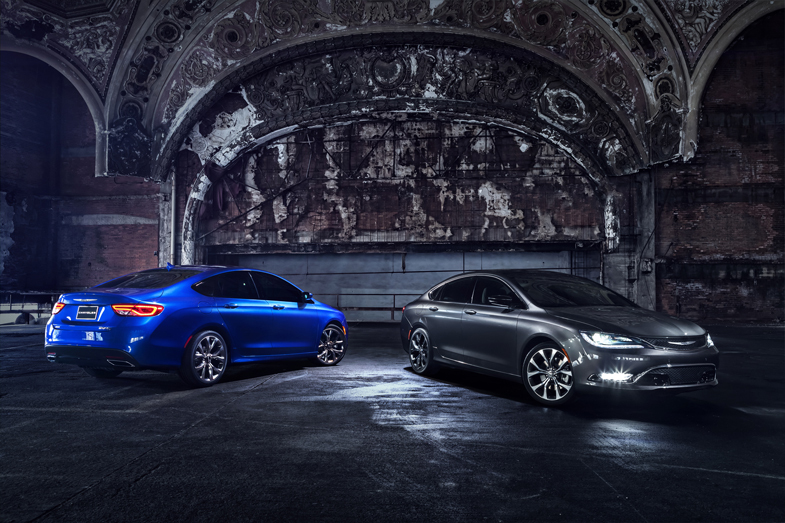 World Class Manufacturing principles and an improved, upgraded assembly plant set the stage for a world-class vehicle – the all-new 2015 Chrysler 200 mid-size sedan. The Sterling Heights (Mich.) Assembly Plant (SHAP), home of the all-new 2015 Chrysler 200, is the beneficiary of a $1 billion investment including an all-new state-of-the art paint shop and a new fully robotic body shop. The all-new 1,000,000-square-foot body shop features fully robotic assembly for precise fit and finish. More than 1,000 new robots in the new body shop enable precisely crafted features, like laser-brazed roof and trunk deck lid joints and consistent fits on every car. The all-new paint shop features state-of-the art technologies that offer customers a beautiful palette of exterior colors from which to choose while reducing costs and the environmental impact of the paint operations. The180-degree “rotisserie” rotating carriers ensure the best sealant coverage of all seams in the vehicle. Lasers check that the sealant is applied properly and in the right locations. Fully robotic paint booths, and the “Round Robot” paint concept where three of the four robots paint a vehicle while the fourth is cleaned and serviced, enable world-class paint coverage for each and every vehicle. Each robot’s applicators are cleaned every two to three hours enabling a consistent level of high-quality paint on every vehicle built. SHAP utilizes a powder primer paint system for the 2015 Chrysler 200, which saves cost and reduces the impact to the environment by utilizing 97 percent of all powder. This is achieved by recirculation of the powder. The all-new paint shop is a “clean” facility, rivaling clean lab environments with dust and contamination control for a better quality paint. Emu feathers dust the vehicles prior to paint application. De-ionization releases the dust from the feathers after each car is dusted, reducing potential contamination prior to paint. Attention to detail ensures consistent, high-quality paint for every 2015 Chrysler 200. The fuel-filler door is mounted in the passenger window during the paint process for paint application in the same direction as if it were mounted on the fuel filler opening, resulting in matching paint and color consistency. New paint technologies enable tri-coat paints for a selection of beautiful exterior finishes. 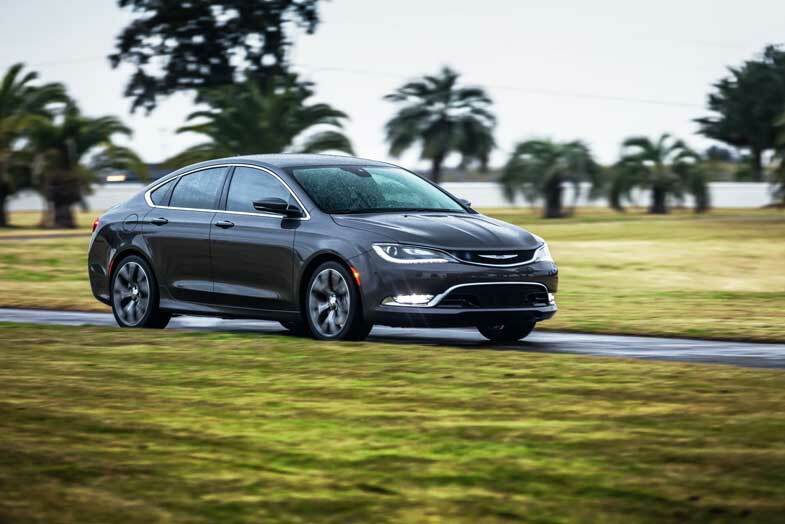 The all-new 2015 Chrysler 200 competes in the mid-size sedan segment, one of the largest segments in North America, with more than 2 million sales annually. Roughly one of every six new vehicles sold in the United States is a mid-size sedan. The 2015 Chrysler 200 is available in four different models in the United States and will arrive in volume in dealer showrooms in the second quarter, 2014. Customers can choose from the 2015 Chrysler 200 LX model, Chrysler Limited model, Chrysler 200S model and the premium Chrysler 200C.